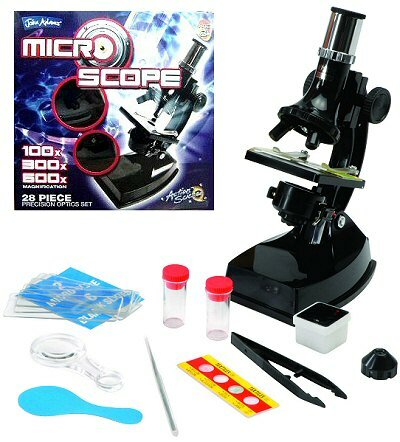 Childrens MICROSCOPE SET: Magnifies up to 600 times! Our POWERFUL Deluxe Miscroscope Set from the John Adams Action Science range of Science & Education learning toys makes an ideal gift for the more inquisitive child, encouraging learning through playing and sparking the imagination. The set comprises a fully-equipped microscope and accessories. This comprehensive microscope set includes everything needed to make your own slides or view those suggested. Suitable for 8 years old and above. Introduction to a microscopic world. Understand the complicated forms of living organisms and static materials that make up the world in which we live. This comprehensive microscope kit includes everything needed to make and view your own experiments or those suggested. With the 28 piece Action Science Microscope Set young explorers can discover a wonderful world in miniature. It uses precision optics giving between 100x - 600x magnification, helping children with their education projects by exploring tiny things or just having fun! The set contains everything a young scientist needs including a quality microscope, light source, vials, slides and much more. Children and adults can examine thousands of things that are difficult or impossible to see with your own eyes. You can see tiny plants and animals and their cells as well as tiny bits of food, air, pollen, fabrics and flakes of dried skin all magnified by between 100 to 600 times. 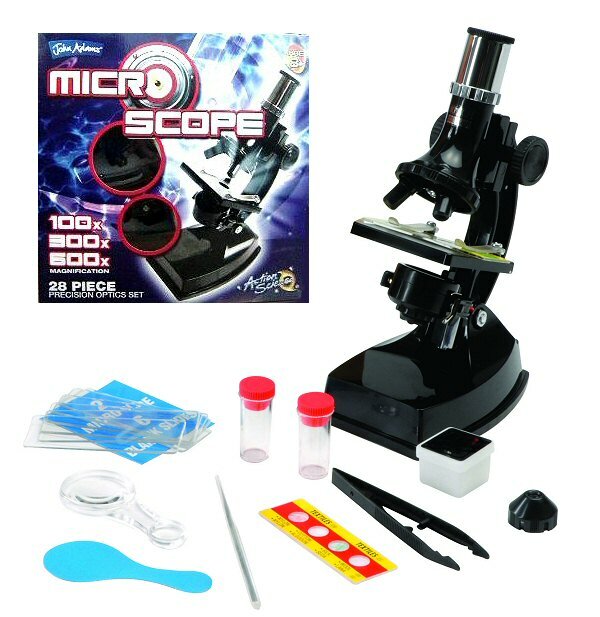 This Microscope Set is an excellent gift for an inquisitive child that also assists with National Curriculum coverage. Famous Scholars: Charles Darwin, while an undergraduate at Christ's College, was more interested in collecting beetles than in studying theology. John Stevens Henslow, Professor at Cambridge, first of Mineralogy and later of Botany, encouraged Darwin's interest in natural history and subsequently recommended his appointment as naturalist on HMS Beagle in 1831. Darwin's experiences on the five-year voyage, and particularly his observations of geology and natural history in South America, led him to formulate the principles of natural selection. He worked on this revolutionary idea for more than twenty years, finally publishing On the Origin of Species in 1859.